This week, the ENN team shows you what goes on behind the scenes when it comes to making an episode. Contrary to popular opinion, good comedy is hard to pull off. It always helps to have someone else around that you can bounce ideas off of and see what's funny enough to garner a laugh and what doesn't quite work. This week's episode of The Escapist News Network shows what goes into creating the comic material for an episode. The episode shows how Kathleen, Graham, Paul and Jeremy work together and pitch jokes about current news stories in the videogame industry. 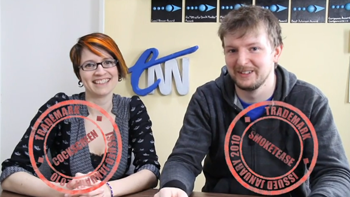 They brainstorm, use the office whiteboard to keep track of ideas, and trademark terms like "cockscreen" and "smoketease." In between bits like pitching potential Capcom clones of successful casual games and creating alternate suggestions for THQ's new logo, the group talks about some of the other big headlines. Some of the funniest parts in the video are when the group is just sitting around the conference table riffing off one another. The bit where they all talk about Final Fantasy XIII-2 and compare it to Final Fantasy X-2 is particularly great. You can see the full episode here. To see more ENN videos, head over to the ENN's video archive.